Plastic Not-So Fantastic: What's the Problem with Period Products? Periods are a fact of life. Some women might say an inconvenient fact of life, but with my background of eating disorders, I am unusually grateful for mine. Amenorrhea and all it’s side effects are much less fun than a little blood each month. Unfortunately, this brilliant function of the female body is accompanies by the need to spend lots of money on “luxury” sanitary products, and ultimately these end up in landfill 99% of the time. It may surprise you that tampons and pads that feel like cotton actually contain polyethylene and polypropylene (aka. plastic), and that’s before any plastic or cardboard packaging and applicators are involved. Those that are made from cotton are more often that not manufactured with cotton grown with masses of insecticides, fungicides and pesticides, which not only ravage the natural environmental but have also been shown to be toxic to the human body even in trace amounts too. What’s more, many tampons and pads are (horrifyingly) tested on animals, and the humans who make them are treated terribly, with some cotton farmers earning less than $1 a day. While incredible innovations in menstrual cups and period pants are coming out almost every day, the majority of us are still using disposable sanitary products, myself included. So what can be done to improve their sustainability? This is where Grace & Green come in. With a background that spans a decade in water, sanitation,m environmental management and social policy across the world, founder and CEO Frances Lucraft launched the first Grace & Green collection in 2014, with the aim to bring and intelligently engineered hygiene products made using 100% organic cotton with a totally transparent production model to women everywhere. Grace & Green use only responsibly sourced, organic materials certified with GOTS, and their products are manufactured using renewable water energy. The cult brand also ensures every product is vegan, cruelty-free and free from any chemicals, bleach or fragrance, plus most importantly they work in partnership with organisations like The Unmentionables and Mayamiko that support women in developing countries where having a period is much harder than it should be. 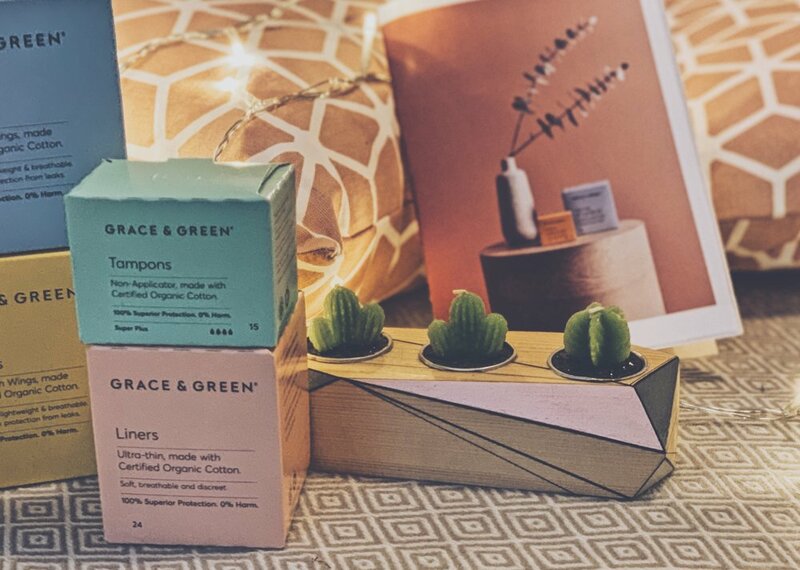 I was sent a variety of Grace & Green products to review for this post, including tampons, pads and liners, and what struck me first was the chic, minimalist, subtle packaging (which is also 100% recycled - win win!). I always say that sustainability shouldn’t compromise on style, and I love that Grace & Green agrees that they should never be mutually exclusive. The products themselves are also super subtle looking and really lightweight to wear, and deliver exactly the results you’d expect with zero leakage or fibres. Good design, integrity and quality mean these are my new go-to period products. Your period is completely personal so why wouldn’t your service be? That’s why Grace & Green offer a convenient monthly and quarterly subscriptions that are designed to be bespoke to your own flow. With a one time, quick and easy set up, you can have your premium period products delivered discreetly to your door every month or quarter (3 months), as and when you need them. If you ever need to pause, edit or cancel your subscription, you can do so in your own personal account area. No fees, no commitment; you are completely in control. With the monthly subscription service, you are already saving 5% on any products, and 10% on a quarterly subscription, but the brand are also offering my readers an extra 10% off any subscription on top off that saving. 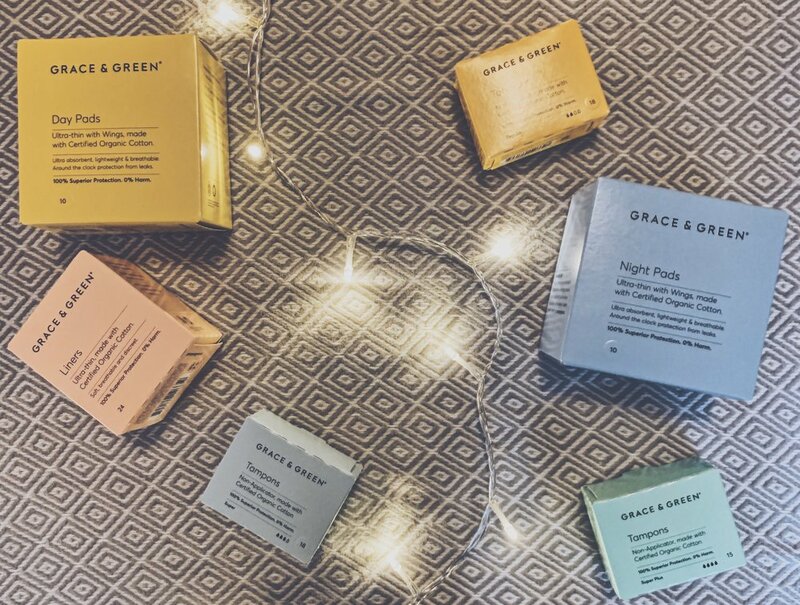 You just need to simply head to the Grace & Green online shop, add the products you need each month to your cart, then at the checkout, click ‘Have a promotion code?’ and enter code G&GRuth to get that extra discount! You can use this G&GRuth code as well as Grace & Green’s current promotion offering 50% off new subscriptions - G&G50. That’s a whopping 60% off! Now, you can be safe in the knowledge that your period doesn’t cost the earth. Remember, use code G&GRuth for 10% off your first subscription order! What Holds You Back From Ethical Fashion?